Loved writing this, but failed to address the question: if the whole clan was listening to the radio, how come only my Dad lost his accent? Must ask him. A meticulous man, DeMel, as he was known, practised speeches many times before the need to deliver them actually came. Like Nicetas of Smyrna, Demosthenes and Cicero, who used their skills of augury—by watching the flight of birds—to practise speeches for future events, De Mellow kept a close watch on history as it was unfolding. “His best running commentaries were at the funerals of Nehruji and Gandhiji. I have a feeling that he prepared well in advance after (Madanlal) Pahwa tried to place a bomb at Gandhiji’s prayer meeting,” PVK says. 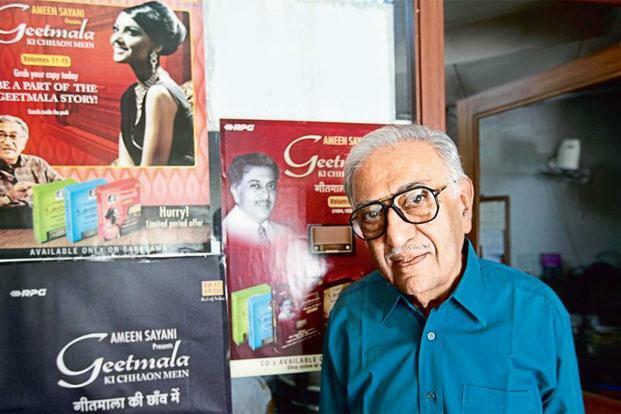 The voice of my childhood, however, was Ameen Sayani and his Binaca Geetmala. Introduced to radio by his elder brother, Hamid, the younger sibling soon became hugely popular for his countdown of Hindi film songs. His opening greeting, both elegant and affectionate, epitomized the Indian ethos, whether delivered to his “Fauji bhaiyon (Army brothers)” or to his “Behno aur bhaiyon (Sisters and brothers)”. My husband recalls napping during hot Delhi summers, radio by the pillow, listening to the reassuring voice of Mr Sayani. Growing up in Chennai, I was not as clued in to Hindi film songs. Instead, I looked up to impossibly sophisticated college boys, who were obsessed with the Bournvita quiz contest, magisterially conducted by the voice of Hamid Sayani. Ours is a family that loves the radio. We may watch talking heads on TV at night, but we still wake up to the sound of the radio, whether it is 100.1, a radio station that plays classical songs in the morning, or other channels that help me practise my Kannada. Radio united India at one point, with everyone tuning in at the same time to listen, like they did when the TV serialMahabharat aired. Can there be a more poetic name for this particular device than Akashvani (voice from the heavens)? This celestial name captured the mythology of an entire continent and forged it into the soul of an instrument, albeit one that is on the verge of becoming an antique. The beauty of the radio is its simplicity. Like a book, it offers some choice in stations (as titles do with books). But once you pick a station or a book, you cannot control the content. Rather, you rely on curation by experts who seemingly know your taste in music better than you. Unlike mobile devices or YouTube, where you can choose every single song that is played, the radio is a relief. You turn it on and off it goes: plain old music peppered with commentary from professional radio jockeys. I would like to believe that the current RJs are not as good as those who came earlier, but that isn’t really true. They speak to the times we live in, and the best ones these days are often young women, sharp of wit, spry of comment and fetchingly laid-back and conversational in delivery—verily the opposite of the baritone that made Walter Cronkite the voice of America. What makes a good radio announcer? Is it a good baritone or a catchy way of speaking? Cricket commentary is what most people associate with radio these days, and this has its own line of giants, including Anant Setalvad, Suresh Saraiya and Harsha Bhogle. My dad remembers smuggling a wire into the long-sleeved shirts they would wear during cricket matches and holding a pocket radio to the ear during classes. An entire class of boys, elbows on desk, head cushioned on palm, staring unwinkingly at the droning lecturer and sweating in their long shirts in hot and humid Kottayam—all so they could listen to cricket commentary. As Mint’s founding editor, Raju Narisetti, told me in New York, today we have households where everyone watches the same show, be it Quantico or Modern Family, on multiple devices in their own space and time. As for the radio, it is relegated to traffic jams.